If you are lucky to have a pizza joint near you that includes garlic knots as part of your order, well, you are pretty lucky. One of my coworkers turned me on to Sal’s Pizza in Milwaukee, and I must admit, their pizza is legit. One slice is all you need, and they typically have a few pies readily available, waiting to be warmed in their ovens, and served within a few minutes. The kicker is, not only is the pizza excellent, but they offer a garlic knot. I’m not sure what I love more, the pizza or the garlic knot. 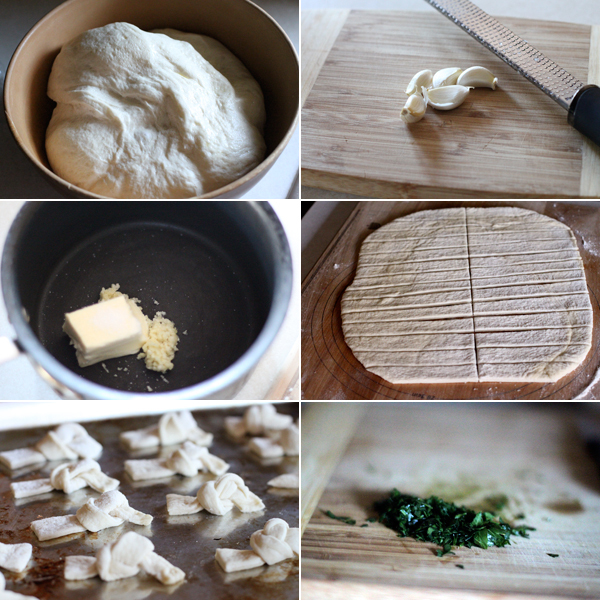 Making garlic knots is almost too simple to be true. Garlic knots, after all are typically treated as a garlic bread appetizer, but they are softer in texture, and offer a garlic butter taste unlike any garlic bread. As I ordered pizza for the team last week, the order came with two garlic knots, of which I was robbed of. So, I decided to make them, and my family is lucky I did. 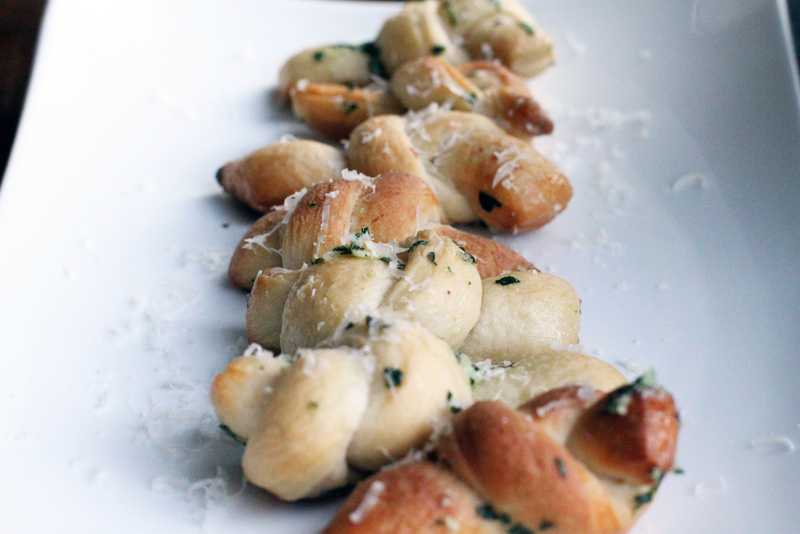 These garlic knots are extremely easy to make and are enjoyed by pretty much everyone. Let’s just say my kids devoured them, and I had to keep my distance after eating a couple of them. Start by adding your water, yeast, sugar, and honey to a mixing bowl. Let this become frothy for about 10 minutes. Take in the smell. It’s wonderful. Once your yeast has activated, add in the salt, olive oil, and flour. Mix this until it forms into a dough ball. You don’t want it sticky, and you don’t want it dry. Take the dough out, and knead the dough for a couple of minutes, before shaping it into a ball and transferring to another large bowl. Drizzle olive oil over the dough to lightly coat. Cover with a large enough towel, and set in a warm place to let it rise. The rising process will take a couple of hours, but I like to let mine rise throughout the day as we most often make the pizzas for dinner. About 3 hours into the rising process, take the towel off and make a fist, and punch it right in the center. This is called punching down the dough. Cover and let this rise another hour or so. Punch it down again before rolling out the dough. Next, add the butter, salt, and garlic to a sauce pan, and on low temperature, begin melting the butter. Next, take some flour and shower your working surface with the flour. You will begin rolling out the dough into about 1/4 inch to 1/2 inch thick, about 15 inches in perimeter. Take a pizza cutter, and cut the dough in half, width wise. Next, slice about one inch slices lengthwise as seen below. Lightly oil the baking sheet with the olive oil, or use parchment paper if you have that. Take a slice of the dough, and make a knot out of it as pictured above. Set the knot onto the baking sheet, and repeat until finished. I made about 24 knots out of this recipe. Lightly brush some of the garlic butter onto each knot, and place in the preheated oven for about 12 minutes, or until a light, golden brown. Add the remaining garlic butter to a large enough bowl to hold all of the knots, then toss in the chopped parsley. Give that a stir. When the knots are cooked, add them into the bowl containing the butter and parsley, and give them a good toss, or three, allowing the remaining garlic butter and parsley to coat the rolls. Shower the rolls with the parmesan cheese, and toss again. Take a smell, you deserve it. Actually, take one, and enjoy. You’ll want another one. And another. I simply served the bowl at the table. If you wanted to, you could present them on a nice platter as shown above, or just serve them in the bowl. They will most likely disappear so fast as they are pretty amazing. Are you a fan of garlic knots, or garlic bread? Simple garlic rolls that are loaded with flavor. Start by adding your water, yeast, sugar, and honey to a mixing bowl. Let this become frothy for about 10 minutes. Take in the smell. It's wonderful. Once your yeast has activated, add in the salt, olive oil, and flour. Mix this until it forms into a dough ball. You don't want it sticky, and you don't want it dry. Take the dough out, and knead the dough for a couple of minutes, before shaping it into a ball and transferring to another large bowl. Drizzle olive oil over the dough to lightly coat. Cover with a large enough towel, and set in a warm place to let it rise. The rising process will take a couple of hours, but I like to let mine rise throughout the day as we most often make the pizzas for dinner. Next, take some flour and shower your working surface with the flour. You will begin rolling out the dough into about ¼ inch to ½ inch thick, about 15 inches in perimeter. Take a pizza cutter, and cut the dough in half, width wise. Next, slice about one inch slices lengthwise. When the knots are cooked, add them into the bowl containing the butter and parsley, and give them a good toss, or three, allowing the remaining garlic butter and parsley to coat the rolls. Shower the rolls with the parmesan cheese, and toss again. Take a smell, you deserve it. Actually, take one, and enjoy. You'll want another one. And another.